Time to grill…time for a beer. Hmm…makes me wonder how grilled beer would be? Probably not good unless you use it to grill brats in. 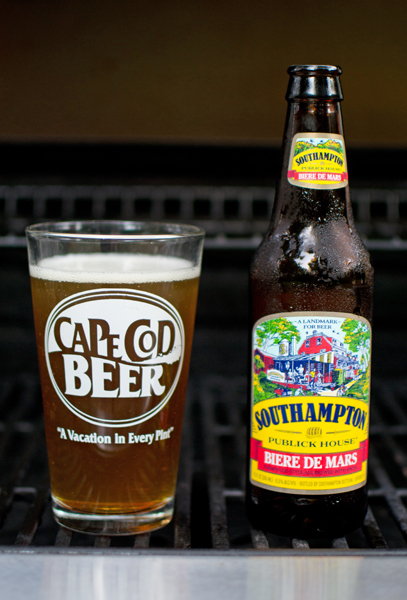 Beer #212 is Biere De Mars by Southampton Publick House from Southampton, New York. Brewed in the style of a Biere De Garde (what? ), this brew has an ABV of 6.5%. A Biere de Garde is a French farmhouse ale typically brewed in winter or spring. Biere De Mars in French means “March Beer”. Let me tell you, there is nothing like springtime in France…not that I have ever been to France but I have heard it is truly magical in the spring. This beer had a light amber or honey color with just a touch of a white head. The nose was caramel malts, earth, and a very faint citrus like fruity aroma. It was pretty one sided taste wise, nothing but sweet caramel and bread (I guess that is more two sided than one). The carbonation was kind of low and it had a slightly heavy body being almost syrupy. This wasn’t what I was expecting when I saw farmhouse ale on the label. I was expecting something more like a Saison. It was OK but it didn’t really go good standing at a hot grill on a hot day. One and done. Lets move on to beer #213…shall we?